The TV, live streaming and radio listings are legal broadcasts of Chelsea - Eintracht Frankfurt in United States. Authentication or subscription with a TV, ISP or streaming provider may be required. Please note that not all channels are available to watch online. If available online, we will link to the official stream provider above before kick-off. Chelsea will look to complete part two of their two-legged quarter-finals task as they welcome Eastern European minnows Slavia to Stamford Bridge on April 18th. Live Soccer TV's match preview provides match facts, team news, and global broadcast listings for Chelsea vs Slavia. 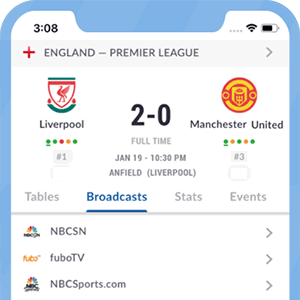 Live Soccer TV's match preview provides match facts, team news, and global broadcast listings for Eintracht Frankfurt vs Benfica. The Belgian midfielder is still scarred by what he lived when working alongside The Special One at Chelsea. Salah and Mane led the Reds to a win over Chelsea while Man City, Tottenham, and Man United also enjoyed weekend victories.